will okefenokee pygmy sunfish eat their own eggs or frys? i could never find the answer to this question... alot of talk about breeding them but never states anything about them eating their own eggs or frys, can some one answer this? You should get all the info you need and more if you search for Erica Lyons Elassoma threads. The short answer is yes, they will eat their fry. Some people put a lot of work into breeding them, and separating the fry from the adults to maximize fry survival. Others take a more laid back approach, and figure that enough fry escape predation that the colony will sustain itself. The laid back approach requires either a lot of plants, or a lot of other structure to provide enough cover for fry to survive. Plants are typically the preferred cover. I have personally witnessed an elassoma gilberti (gilbert were the same as elassoma okefenokee until the species was split in 2009) female eat either her own or her sister's fry. My suggested method for breeding elassoma is to put adults into a tank and then, a month later, remove all the adults. Feed the 'empty' tank vinegar eels, microworms, baby brine shrimp, etc and two months later you will have around 20 juveniles per adult female. When I tried raising the adults in the tank with their fry they would hunt down and eat them all. I lost a colony to no fry production in that manner; they just eventually died out. 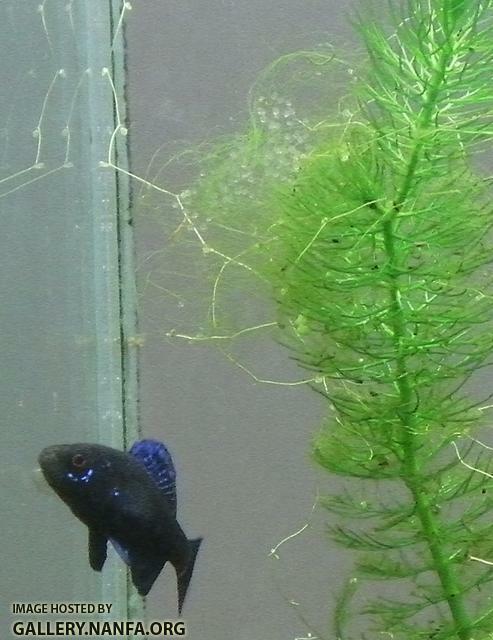 Their life span's about two years max, so if you're not producing fry soon you don't have any fish. Some people have had success with adults in the tank with eggs, but if you don't see any new juveniles within six months, act fast or you soon won't have any adults. All it takes is simply removing the adults from the tank to produce quite a lot of fry. also would they breed in a acrylic yarn breeding mop? Edited by bryanmc1988, 01 June 2014 - 01:42 PM. They breed anywhere and everywhere. The egg production isn't the problem. wont the un-eaten micro worms die off and pollute the water? If your tank's been set up for a while and the filter (which I hope the inlet has some mesh over it to avoid sucking in the babies) has been set up for more than a month, then you've got nitrogen processing bacteria. The ammonia from microworms, vinegar eels, baby brine shrimp, etc will be processed by that bacteria same as whatever food you're feeding the adults now is. Nitrate, the end product of bacteria ammonia conversion, is then removed via water changes or being eaten by live plants. The LC50 of ammonia, or the amount that kills half the population in 72 hours, is 0.43 ppm according to http://www.ncbi.nlm....ps LC50 ammonia The LC50 of nitrate is 4453 ppm. Myself, I employ some rather fantastic plant ammonia processing. More info here http://www.theaquari...ical_Filtration and in Diana Walstad's book Ecology of the Planted Aquarium. The gist can be gotten from table 2, which shows that water lettuce absorbs even 26 ppm ammonia in 4 hours. This means plants are awesome, and explains why my tanks are just plants and an air stone and they have healthy fish. i had them for over 6 months and not see 1 fry... 4 males and about 7 females in a heavily planted 10g tank. Stick the parents in a spare 10 gallon and feed the 'empty' tank. You've got lots of fry in there if you see one. As one of those "laid back folks" that Skipjack mentioned... I think you have too many adults in a ten gallon tank to successfully get fry. You need to thin out your adults to multiple tanks (or of course, just do like Erica says and move them all to another tank... you definitely have fry in there that you cannot see... Elassoma are masters of camo! What do you feed them? I found they were a lot friendlier when I fed them grindal worms. Once they figure out how tasty grindal worms are, they'll come forward to the front even right in front of you to eat them. Live worms make keeping elassoma much more fun. Here's a video where you can see they don't flee during feeding time. Yup. If you keep hand feeding them like that, they get used to you being there. Some will even learn to beg for food when you're there. The babies raised in your tank will be tamer than those gotten elsewhere. Edited by bryanmc1988, 02 June 2014 - 10:10 AM. My elassoma eggs always fell through all the way to the ground. The one time they stayed up in the plants I took a photo, because it was weird. They were sitting on cladophora algae. Sitting on, not stuck to. When I sucked them with a turkey baster, they came right off into the baster. They were fertile, I hatched them. You're going about this in a very complicated way. I'm telling ya, it's really really really not hard to spawn elassoma. You put the parents in a tank for a month, you pull them out and put them in a different tank. Voila, 20+ juveniles per female. You don't have to do any of this complicated mop stuff or that bottom mesh layer stuff. Don't use gravel; if the egg settles in between two rocks it'll suffocate and rot. You can use sand, pure clay kitty litter, or a bare bottom. Any shadow will do. They'll spawn under a plant leaf, under a yarn mop, under a statue that says "NO FISHING". Any shadow works. As long as they're well fed, they spawn basically continuously. Getting eggs is not the problem. It's knowing to remove the parents so the fry don't get eaten. 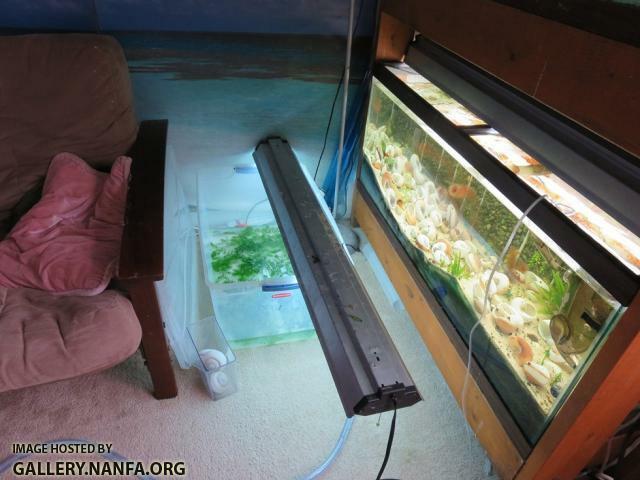 Try a once a month rotation style, moving the adults to a new tank once a month. I stuck five elassoma okefenokee in a bucket tank and ignored them for a month and a half. And by ignore I mean I fed the adults bloodworms like once every three days and never fed fry food. I fed the plants fish flakes every other day or so. A month and a half later I took the adults out, kept scooping, and recovered fully 100 juvenile fish. Elassoma by all rights deserve to be considered beginner level fish. I fed the fry vinegar eels every day after recovering them, then moved them onto grindal worms once they were large enough. I sold probably ten different auctions on aquabid just from the fry I recovered from that bucket. Easy peasy fish to breed. Don't be scared, you can't mess it up. Just take the adults out. That's the only 'trick'. Took me three years to figure that one out. Since I have, fry galore. Before I did, no fry at all. 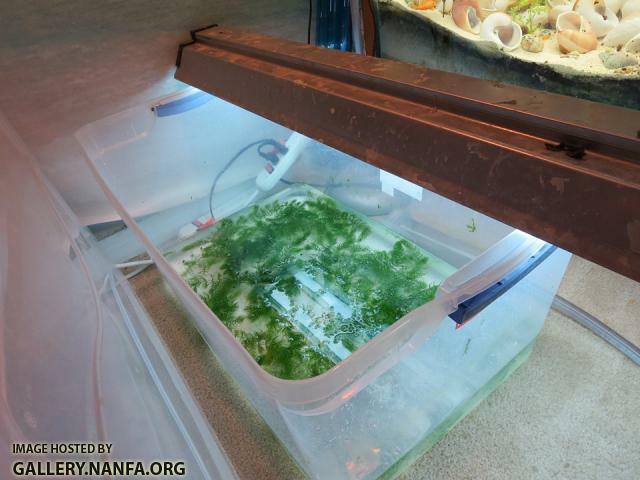 Your fry separation method might work, but that tank has no ammonia processing. The reason the fish do so well in my tanks is instead of that yarn mop, I use ceratophyllum. Replace the yarn with ceratophyllum and replace the mesh bottom with a flat glass, sand, or kitty litter bottom, and you'll have a great setup. Choose wide instead of tall tanks and you won't even need an air stone. My bucket tank didn't have one. *nods* As it is, I don't know how the larvae are going to escape from the mesh. You're gonna trap them down there; they're bigger when they hatch then they are as first laid eggs. Unless you remove the adults and the mesh divider the moment you see eggs, I just see them getting stuck and dying down there. The eggs hatch in three days or so, then they need food like crazy. Detritus from plants is a good first food, as demonstrated with the success of the bucket tank. its a 7 gallon tank (24" x 24" x 10" high) with the mop, is it ok to have 2 males and 4 females per 7 gallon tank or will the males kill each other? Edited by bryanmc1988, 02 June 2014 - 11:48 AM. I see no reason why this won't work just fine. I suspect that people like the live plants because they provide a lot of area for algae, and whatnot to grow, which in turn supplement the fry early on. Male elassoma never kill one another. They're all show, no bite. You will just probably not have enough space for both males to spawn. It's likely that one male will color up and the other will be submissive colored. Divide the sight lines a bit more and both may potentially claim a territory. Two mops? I dunno. Now that I know the mesh is removable, I'm changing my earlier opinion. That sounds like a good setup. If the mesh is removable then I can see what you're saying. 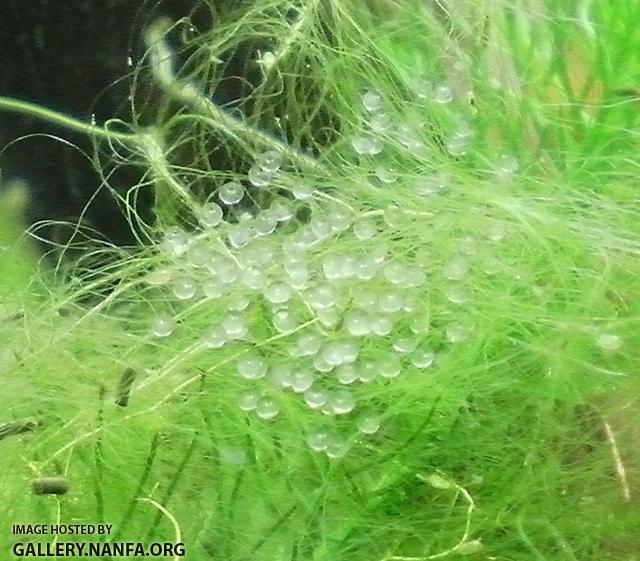 It would be a big advantage to be able to separate the eggs out from the parents without having to physically remove the parents from the tank and put them in a new tank. Your mesh bottom solves the problem of 'what tank should I put the parents in next?" Instead, you just remove eggs when you see them and then you have a tank for small fry, a tank for medium fry, and a tank for juveniles. Yes, that would work quite nicely. I can definitely see the advantages. Can you show us how you built those tanks? I'd like to try them. Also I never need to perform water changes, ever. No ammonia spike kills my fry, ever. Gotta love that convenience: feed but don't clean. If you want to chat about plants, I'm here for you. Long story short an $8 Home Depot clamp light with a 1600 lumen daylight spectrum bulb for around 8 hours a day combined with nonzero nitrate concentration would grow your plants great with no algae. Ceratophyllum's big problem is often either not enough light, or the dissolved nitrogen (ammonia, nitrite, nitrate) drops to 0 ppm. Without roots, it's dependent on the water column nitrogen to make new proteins. So you'll catch me feeding the fish tanks with flakes every few days, not for the fish, but for the plants. Fish flakes are a nice nitrogen source for the ceratophyllum. It also feeds the snails and copepods, which elassoma eat. Home Depot clamp light, 1600 lumen daylight spectrum compact fluorescent bulb. I bought my bulbs in a pack of four for $10. The clamp light was $8 and some change. Edited by bryanmc1988, 02 June 2014 - 01:38 PM.